Picture it: Brooklyn, 2015. Obama is in the White House, Congress is ineffectual, the whole Northeast is tottering between Spring and Summer, and I forgot how to change gears rapidly when the grocery store is out of the ingredients I want for dinner. This dinner was basically me playing Chopped the home game one night, when a Thursday hit and I realized I had only about half of the required items for the dinner I had planned on making, but had not really come up with a solid B plan. So I played. And it worked! Go, hours of watching cooking shows on television! First, make your meatballs. Add the ground beef to a large bowl. Pick and chop 1/2 tsp. thyme and 1/5 tsp. rosemary. Add to the meat. Grate 1 clove garlic and add. Add 1 big pinch of Kosher salt and a few grinds black pepper. Dice the preserved lemon and add 2 tsp., reserving the rest. Add the balsamic vinegar, curry powder and baking soda slurry. 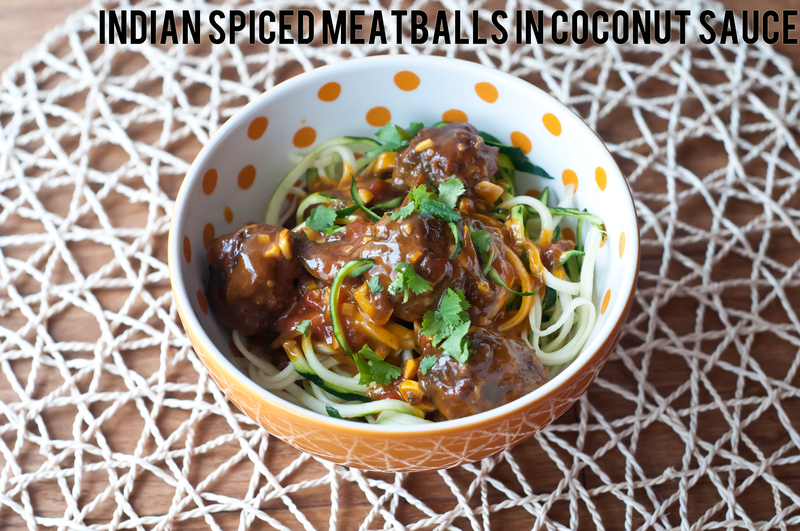 Mix and form into ping pong ball sized meatballs. Add to a large pan over medium heat and brown on all sides. 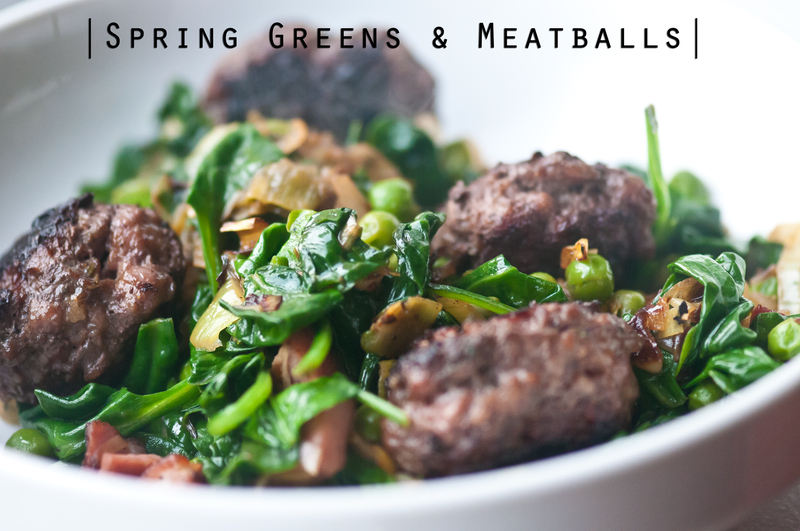 While your meatballs are cooking, cook your greens. First, chop your bacon and add to a pan over medium heat. While the bacon is working, wash and halve the leek and cut into thin half moons. Slice the second clove of garlic and chop the last 1 tsp. thyme and 2 tsp. rosemary. Add to the pan when the bacon is half rendered. Cook, stirring occasionally, until the leek is getting soft and browned in spots. Add the peas and stir, letting cook for a few minutes. Add the butter and stir, letting melt. Add the rest of the preserved lemon (about 1 tsp.) and half the spinach and stir until wilted. Add the rest of the spinach and wilt. Mmmmmm … cabbage rolls. 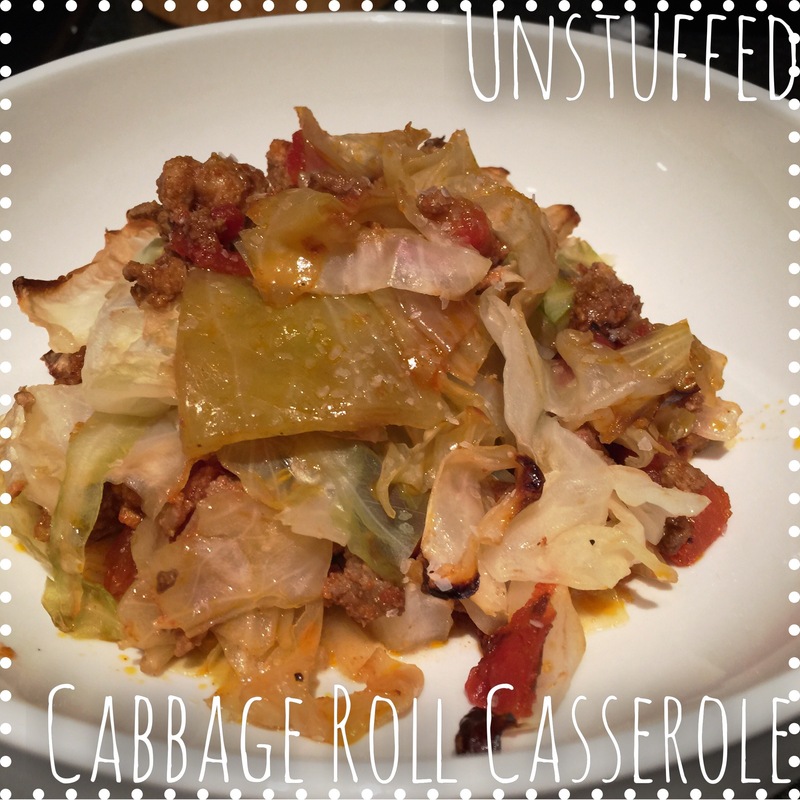 I remember the cabbage rolls of my childhood fondly – except I never thought they had enough cabbage. I would have been happy if my mother served equal parts cabbage, ground beef and tomatoes. The rice I liked, but nowadays don’t need. This recipe is cobbled together from different Internet sources, but draws mostly on inspiration from a recipe I found on Health-Bent. Core your cabbage and cut into thin ribbons. Boil in a large pot of salted water for 10 minutes. Drain and toss with a few sprinkles salt. While that is working, brown your meats in the ghee. Add the spices and combine. Let go a few additional minutes. Add the tomatoes and vinegar and mix well. In a large casserole or baking dish, layer your cabbage with meaty tomato mixture – I used a large glass baking dish and had two layers of cabbage with one layer of meat. Do whatever makes you happy. Bake 1 hour or until the top is browned and everything looks casserole-y. Let sit 30 minutes before serving so the juices can distribute evenly. 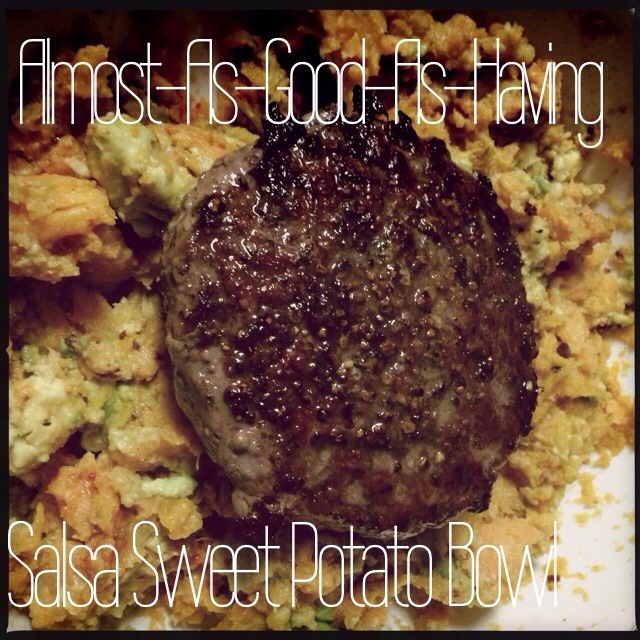 This is based on a recipe posted by one of my Nerd Fitness Whole 30 partners in crime – Fonzico. Her version adds cauliflower and egg as a meatball binder (think breadcrumbs and egg in “regular” meatballs) and sounds delicious as well. 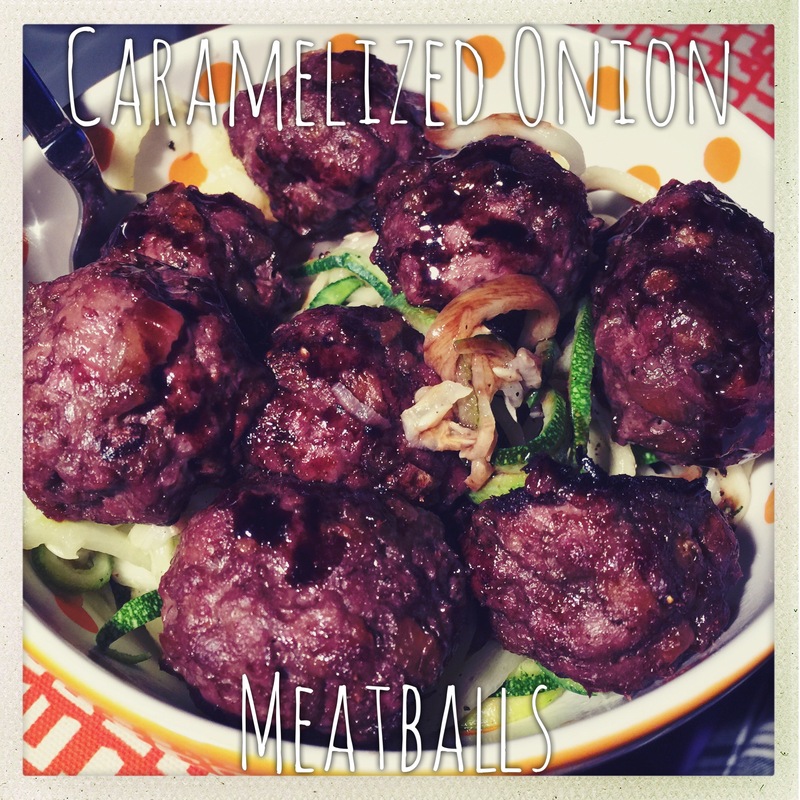 I couldn’t find cauliflower at the store this week, so made these balls using my general method. And they came out well. A little sweet from the onions, moist and light from the added ingredients and pretty perfect atop a pile of zoodles drizzled with some nice aged balsamic vinegar. As reported by the hubbs, they are also good with leftover baked ziti. First, we’ve got to knock those onions out. Peel and dice your onion and add to a medium-high pan with the ghee. Sauté until just beginning to brown, bring the heat to low, and let go about 45 minutes (stirring every once in awhile) or until the onions are sticky, broken down and a deep caramel color – if your pan gets too dry at any time, add a little water and stir. Let cool. Preheat your oven to 375 F and line a baking sheet with foil. Combine the onions with the rest of the ingredients, making sure to not overmix. Form into ping pong sized meatballs, placing the finished balls on the sheet as you go. Bake 25 minutes or until browned and cooked through. Serve with zoodles & balsamic for a simple dinner. Makes enough for 2-3. 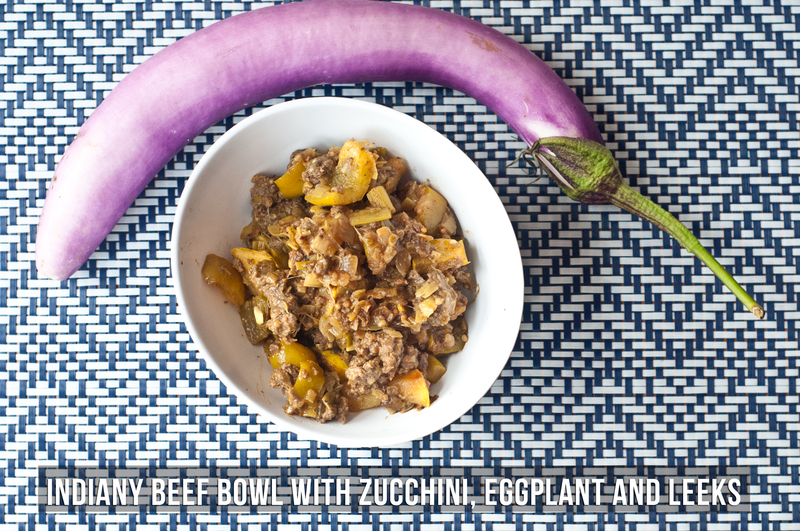 I’ve gotten stuck on vaguely Indian-spiced bowls of beef + tons of CSA veggies lately. I partially blame this place and it’s Chipotle-like bowls of meat + lettuce + toppings awesomeness. This dish started out as a semi-sincere rip of their beef keema salad bowl, which is enchanting. And then I got to tinkering/looking into the fridge to see what CSA veggies needed eating immediately before I went to pick up the new batch. And a new franken-bowl was born. First, prep your aromatics. Clean your leeks, halve length-wise and slice into thin moons. dice your onion. Chop the garlic. Heat 2 Tbsp. Fat Of Choice (I used ghee) in a large skillet over medium heat. Add the aromatics and cook, stirring frequently, until the leeks have softened and the onions are translucent. While that is cooking, grab your spices and beef. When the aromatics are ready, add your spices + liberal pinches of salt and black pepper and stir to combine. Let cook until fragrant (about a minute). Add the beef and cook until just browned, breaking up and stirring frequently as you go. While the beef is working, chop the pepper, zucchini, and eggplant. When the beef is just browned, add the veggies and stir to combine. Let cook, stirring frequently, 10 minutes or until the veggies are soft. Taste for salt & pepper and adjust as necessary. Turn the heat off and hit with the lime juice. To make roasted eggplant: Place a large foil-lined sheet about 6 inches under your broiler. Poke your eggplant (I used skinny purple Japanese and streaky purple & white varieties) with a fork a few times and broil until blackened (5 or so minutes, depending upon the size of your eggplant). Flip and blacken until the whole thing is black and yields to a poke – you want no resistance left but not a fiery mess. Let cool and peel the burnt skin. Save for a bunch of applications. This dinner earned high praise from the DH – the sauce wasn’t his favorite thing on Earth, but I loved it and he loved the texture – and he loved the texture of the meatballs. I think this method (cribbed from Melissa Joulwan of The Clothes Make The Girl) is going to be my general go-to from now on. First, make the sauce. Mince the garlic, grate the ginger, chop the tomatoes and collect your other ingredients. In a medium pan, sautee the garlic and ginger over medium heat in 2 Tbsp. fat until beginning to soften. Add the turmeric and stir, cooking 1 minute more. Add the tomato and, stirring frequently, cook 5 minutes. Add the rest of the ingredients and simmer 5 minutes more while you prep the meatball components. In a large bowl, add the beef, salt, and granulated garlic. Grate the onion and add to the bowl (you want about 2 Tbsp.). Chop the cilantro and add. Bash the fennel to break it up a bit and add. In a separate bowl, combine the warm water with the baking soda and cream of tartar; stir to combine and add to the meat bowl. Combine and shape into ping pong sized meatballs. Add 2 Tbsp. fat to a large pan and bring up to almost shimmering. Drop the meatballs into the pan as you finish making them and brown on all sides, shaking the pan as you go – 5 minutes or so. Add the sauce and let simmer until balls are cooked through and the sauce reduces a bit and becomes almost velvety – about 10 minutes. Top with more cilantro if desired and serve. Mmmm…. Thai. I’ve been missing the tart/sweet flavors of Thai food in my life lately, and this meal was just the correction for that loss. This sauce is kickin – and could definitely be used on a salad if you have leftovers, or as a dipping sauce for some lettuce wraps. Yum. In a large pan over medium-high heat, brown your ground beef until crispy. Remove to a paper towel lined bowl. While that is working, mince your garlic and ginger and thinly slice the onion. When the pan is free, add the coconut oil and sautee the ginger, garlic and onion until softened (stirring frequently to avoid burning). Add the pepper, which you’ve cut into thin strips. Sautee until beginning to soften, stirring frequently to avoid burning. Add the carrots, scraping up all the delicious browned bits from the meat. Sautee until the carrots are softened and everything is starting to brown. While this is working, make your sauce. Whisk the coconut milk and almond butter together over medium heat to combine, making sure to beat all the lumps out. Cut the heat and add the rest of the ingredients. Turn the heat back on for a minute or two to thicken a bit and whisk to combine. Let sit while you zoodle. I happen to like my zoodles raw, so I made them at this point. If you prefer yours cooked, add with the carrots. Don’t forget to chop your cilantro, if using. 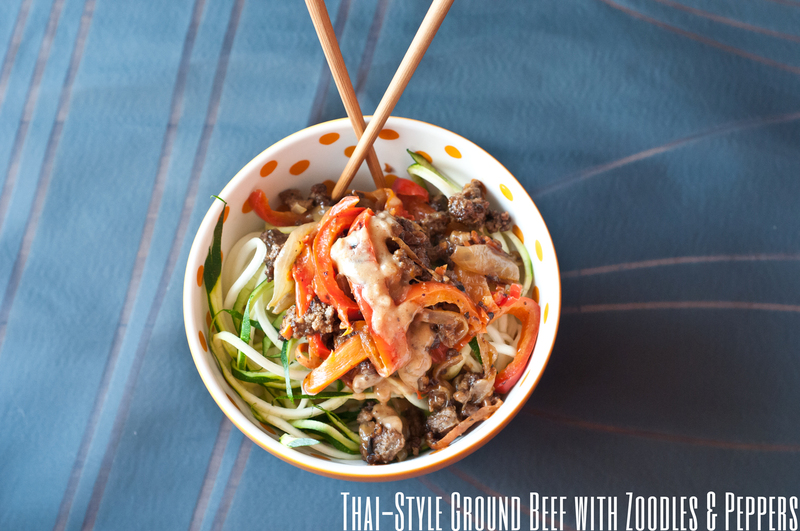 To serve: toss the beef mixture with the sauce and either spoon over the zoodles or throw the zoodles in and toss. Sprinkle with cilantro before hitting the table. This is another of those recipes cobbled together from random inspiration on the Internets. 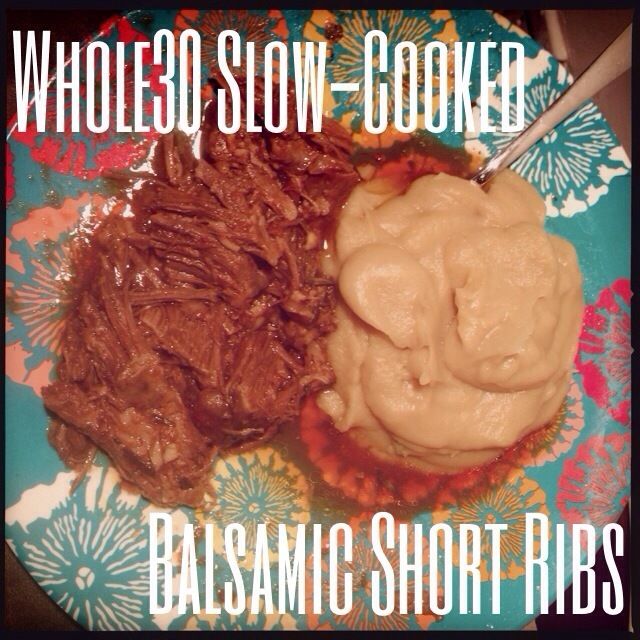 I had short ribs, I’m in the middle of a balsamic vinegar obsession, I have fallen in love with my new slow cooker – and bam. This. 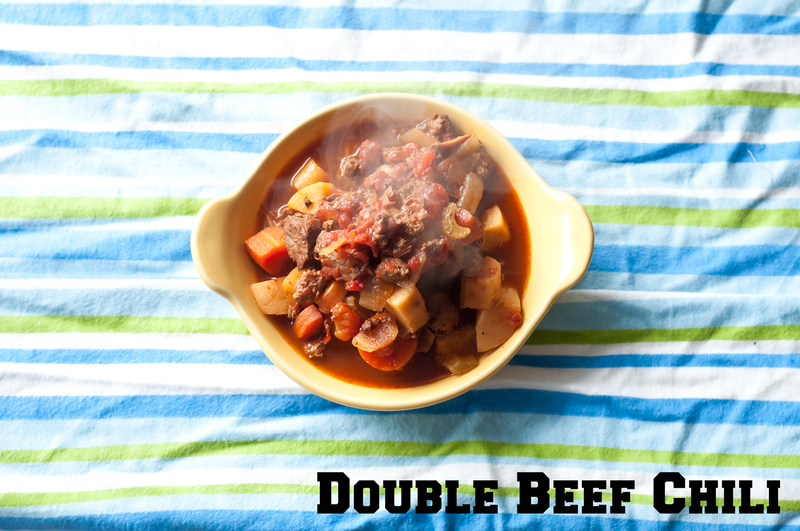 Set the beef in your slow cooker. Mix together the rest of the ingredients (minus the beef stock) and pour over the meat. Add a few splashes of beef stock until the liquid barely covers the meat. 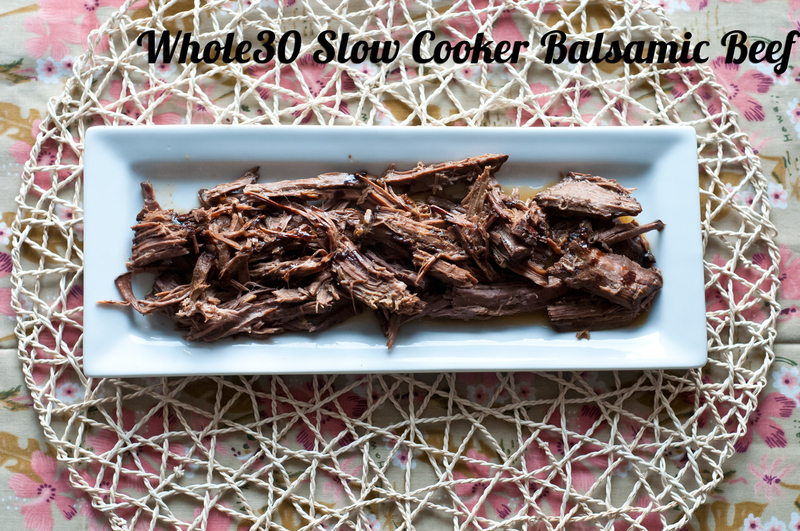 Latch your lid down if your slow cooker has latches and let cook 4-6 hours on High. When done, the meat should shred like butter. If you then reduce the cooking liquid on the stove, the resulting gravy will be great. I served with a simple parsnip mash (parsnips cooked in the rest of the beef stock for 8-10 minutes and whirred in the blender with a few splashes stock to even out). This recipe is tasty. Not quite what I had envisioned (I had visions of sticky almost tart beef dancing in my head), but good. A great ‘cook once and use as the backbone for many meals’ recipe. I’ve served over brussels sprouts, eaten straight of the container, and paired with mashed cauliflower this week – I’m also dying to try it as a “pizza” topper, as a “taco” filling, and with more and varied greens. Yum. Plop your meat into a slow cooker. Combine all other ingredients and pour over top. Cook on High 4-8 hours. When your beef can shred with a fork, it’s done. Remove to a platter and go to town. 4-8 hours? Can you be more specific? Here’s what happened: The original recipe calls for 4 hours on High or 6-8 hours on Low. This is the second time using my new crock pot and we weren’t sure if we needed to latch the lid down while cooking or if that would cause some sort of meatsplosion, so we left it unlatched. Came back 4 hours later and the meat was about half done. So we latched the lid and put it on for another 4. If you know how to operate your crock pot properly, I’d go with the original cooking directions and work from there. Makes a bunch. I’ve gotten at least 2 dinners for two out of it + 3-4 lunches and I still have 1-2 days’ worth of lunch portions leftover. I realize this is not the best photo, nor is the most exciting dish out there – but it did do make a little dent in the craving I was having one night. I love salsa, guacamole, lime juice and tacos – I could live off of them happily. Sadly, tacos (at least tacos with corn tortillas + the tortilla chips they come with) are a no-go on Whole30. One night it was just me for dinner and I was having a wicked craving for salsa. Like full-blown nothing else would do in my life craving – but I had no W30 tomato products in the house but tomato paste, and that’s not happening. I briefly considered picking around the corn and beans in the jar of salsa I had – but a: that’s cheating, b: that salsa wasn’t what I wanted, and c: the bean and corn to tomato ratio was too high. And since I’m lazy and it was arctic cold out, I decided to rough it out with what I had in the house. I’m happy to report, that while this dish isn’t beautiful – it did fit the bill. Reheat your sweet potato under the broiler if it’s a leftover; bake if not. While that is working, cook your burger to your liking – I do 3 minutes per side in a medium-hot pan. When the potato is done and cool enough to handle, slip the skin of however you can. Add to a bowl and mash. Add the avocado and spices and mash some more. Top with the burger patty and go to town.